Azerbaijani musicians will take part in the second annual Oud Festival, which will be held on April 5-8 in Qatar. The festival is considered a first in the region which celebrates the oud - a stringed instrument central to Arabic music. The oud is a short-neck lute-type, pear-shaped stringed instrument with 11 or 13 strings grouped in 5 or 6 courses. Four strings of musical instrument likened to the four elements of nature: fire, water, earth, air. It was often represented in the works of miniature painting. More than 80 musicians from a number of countries, including six groups and 18 solo performers will attend the festival. The festival will witness performances by some of the greatest names in oud music from Kuwait, Spain, Turkey, Azerbaijan, Iran, Indonesia, Malaysia, Iraq, Japan, Greece, Oman, Morocco, Syria and Tunisia. The cultural event will be dedicated to the famous Islamic philosopher Abu Nasr al-Farabi ("Second Teacher"), who made a significant contribution to the development of culture, philosophy and music. At the festival's opening ceremony, a film about al-Farabi will also be demonstrated. Notably, Qatar's First Oud Festival held in March last year was dedicated to Ziryab, the legendary musician of the Arab and Islamic world. During the four-day festival, talented oud makers from across the globe will display their skills and craftsmanship. 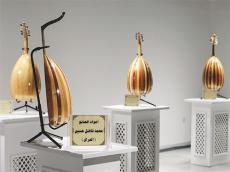 The exhibition will showcase antique oud instruments made by legendary luthiers (makers of stringed instruments). Moreover, the festival will feature lectures, forums on Oud making. The event will conclude with an amazing musical show dedicated to Al Farabi.